The Xbox One Digital TV Tuner is available for users in France, Germany, Italy, Spain, Australia, and the United Kingdom. 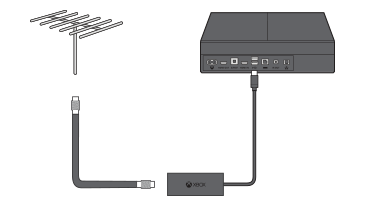 This page describes setup, use, and troubleshooting of the Xbox One Digital TV Tuner. The Xbox One Digital TV Tuner is a USB accessory that you can use to watch free-to-air digital TV with Xbox One. The new digital TV tuner will support free-to-air DVB-T, DVB-T2, and DVB-C television standards. You can use the Xbox One Digital TV Tuner to experience premium live TV services without a set-top box. For example, you can pause live TV and use the Xbox Snap feature to watch TV while playing a game or using an app. Watch free-to-air DVB-T, DVB-T2, and DVB-C television channels without changing TV inputs. You can receive game invitations and notifications while watching TV and even watch TV while waiting for a multiplayer match to start. Watch TV when two or more apps are snapped or while using Skype or other apps. Show TV listings in the OneGuide. Create your own personal favourites in the OneGuide so you can easily choose what you want to watch. Call out your favourite TV channel by name and start watching it instantly. Access the OneGuide on Xbox SmartGlass with the ability to tune channels on your TV. Find out which TV shows in the OneGuide are available on demand from video apps. Access TV content from both the Digital TV Tuner and the HDMI-In input, all of which are integrated into the OneGuide and available in one place. Use TV controls like stop, pause, forward, and rewind, in addition to voice controls via Kinect. Press the Menu button on the controller. Follow the prompts for OneGuide to complete TV setup. For more guidance, see Set up live TV with your Xbox One. Make sure you are in a country that supports the Xbox One Digital TV Tuner (as listed at the top of this article). TV features will not work with this tuner in other places. 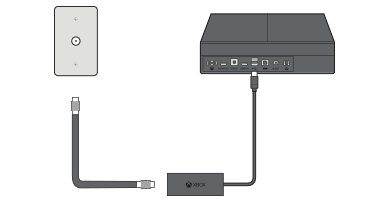 To test the signal, unplug your cable input from the Xbox One Digital TV Tuner and plug it directly into a TV or monitor. If your signal is still bad, consult the TV signal provider. If your signal is good, reconnect your input to the digital tuner and continue to the next step. Follow the prompts for Troubleshooting. Check out the Troubleshoot section of OneGuide and Live TV support. Use the Live TV on Xbox One forum to get help from our experts and the community. If these steps didn’t solve the problem, your tuner may need to be replaced. To order a new tuner, go to Device Support. If your tuner is damaged, do not use it. To order a new tuner, go to Device Support. ¿Quieres contactar con el Soporte técnico con referencia al problema "Xbox One Digital TV Tuner" acerca del que estabas leyendo o con referencia a otro problema?